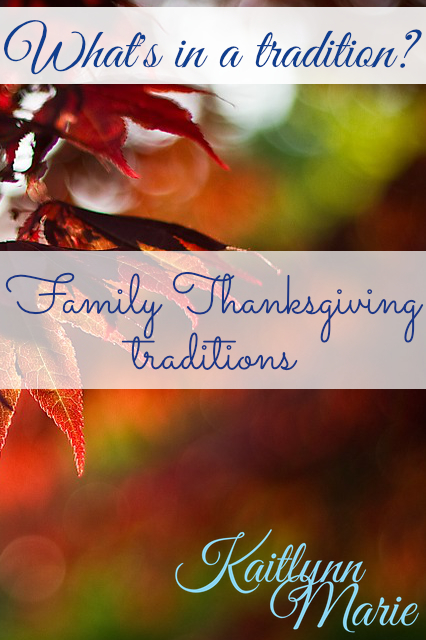 Kaitlynn Marie: What’s in a tradition? It’s Thanksgiving here in the United States; that wonderful time of the year when we’re meant to be thankful for what we have and celebrate among family and friends. I’m sure that’s how most families spend today. Not mine. Well, sort of anyway. We do the whole “this is what I’m thankful for…” spiel at the dinner table, usually. And we get together as a family every year. But the number of people joining us at the table has dwindled since my grandmother passed in 2010. It used to be we’d have all seven of my grandmothers’ children, and all of their children, and their children. But this year it’s just going to be my mom, one uncle and my siblings and the niece and nephew I live with. Some cousins and their mother are in New York, other cousins and their dad are in Rhode Island, some are right here in Southeastern Connecticut, but we celebrate as a small unit, rather than congregate as one huge unit like we used to. Another thing I remember about Thanksgiving is that as a Native American, growing up this day has always been a bit awkward. My father taught me from a young age the true history and how the pilgrims tricked our people even while we were helping them. Had the first “Thanksgiving” never occurred, the pilgrims likely would have died. My dad used to call today “Turkey Day” and often, so do I. 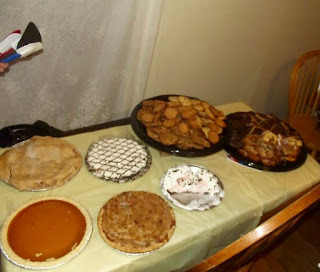 We don’t have many traditions for Thanksgiving in my family. Honestly, one of the most prominent “traditions” is that every year there is some spat or another; usually involving one cousin in particular. He isn’t coming this year, so hopefully the fighting will be at a minimum. The biggest thing that could be considered a tradition that our family did was just to get together at my grandmother’s house every year. And since she’s passed that tradition has died. Honestly, since my father died, and my grandmother before him, Thanksgiving feels like just another Thursday to me. How do you celebrate Thanksgiving? Together as a family, or by yourself? Let me know in the comments below!